Homelessness was present before the Great Depression, and was a common sight before 1929. Most large cities built municipal lodging houses for the homeless, but the Depression exponentially increased demand. The homeless clustered in shanty towns close to free soup kitchens. These settlements were often trespassing on private lands, but they were frequently tolerated or ignored out of necessity. The New Deal enacted special relief programs aimed at the homeless under the Federal Transient Service (FTS), which operated from 1933–1935. Some of the men who were forced to live in these conditions possessed construction skills and were able to build their houses out of stone. Most people, however, resorted to building their residences out of wood from crates, cardboard, scraps of metal, or whatever materials were available to them. They usually had a small stove, bedding and a couple of simple cooking implements. Men, women and children alike lived in Hoovervilles. Most of these unemployed residents of the Hoovervilles relied on public charities or begged for food from those who had housing during this era. Democrats coined many terms based on opinions of Herbert Hoover such as "Hoover blanket" (old newspaper used as blanketing). A "Hoover flag" was an empty pocket turned inside out and "Hoover leather" was cardboard used to line a shoe when the sole wore through. A"Hoover wagon" was an automobile with horses hitched to it, often with the engine removed. After 1940 the economy recovered, unemployment fell, and shanty eradication programs destroyed all the Hoovervilles. Bonus Army marchers confront the police. Anacostia in the District of Columbia: The Bonus Army, a group of World War I veterans seeking expedited benefits, established a Hooverville in 1932. Many of these men came from afar, illegally by riding on railroad freight trains to join the movement. At its maximum there were 15,000 people living there. The camp was demolished by units of the U.S. Army, commanded by Gen. Douglas MacArthur. Central Park, New York City: Scores of homeless families camped out at the Great Lawn at Central Park, then an empty reservoir. Riverside Park, New York City: A shantytown occupied Riverside Park at 72nd Street during the depression. Seattle had eight Hoovervilles during the 1930s. 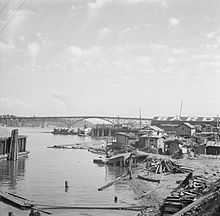 Its largest Hooverville on the tidal flats adjacent to the Port of Seattle lasted from 1932 to 1941. St. Louis in 1930 had the largest Hooverville in America. It consisted of four distinct sectors. St. Louis's racially integrated Hooverville depended upon private philanthropy, had an unofficial mayor, created its own churches and other social institutions, and remained a viable community until 1936, when the federal Works Progress Administration allocated slum clearance funds for the area. Hoovervilles have often featured in popular culture, and still appear in editorial cartoons. Movies like My Man Godfrey (1936) and Sullivan's Travels (1941) sometimes sentimentalized Hooverville life. Man's Castle, a 1933 film directed by Frank Borzage, focuses on a number of down-and-out characters living in a New York City Hooverville; the main characters (played by Spencer Tracy and Loretta Young) are lovers who cohabitate in a shanty outfitted with a skylight. In 1936 screwball comedy My Man Godfrey, "Forgotten man" Godfrey Smith (played by William Powell) is living in a Hooverville when he is patronised and "adopted" by Irene (Carole Lombard). In Sullivan's Travels, a 1941 comedy film written and directed by Preston Sturges, John L. Sullivan, a wanderlust movie director, played by Joel McCrea, visits a Hooverville and accidentally becomes a genuine tramp. The musical Annie, has a song called "We'd Like to Thank You, Herbert Hoover," which takes place in a Hooverville beneath the 59th Street Bridge. In the song, the chorus sings of the hardships they now suffer because of the Great Depression and their contempt for the former president. In 1987, the Liverpool group The Christians had a British hit with the song "Hooverville (And They Promised Us The World)". In "Daleks in Manhattan" and "Evolution of the Daleks", two Series 3 episodes of Doctor Who, The Doctor and his companion Martha Jones travel back in time to New York City during the 1930s and visit the Hooverville in Central Park to investigate several mysterious disappearances of its inhabitants. In the episodes, it is stated that [a] Hooverville is "a place for anyone who has nowhere else to go." In the episode, people from Hooverville were being used as cheap labor for construction of the Empire State Building. During a temporary housing crisis, the comic strip Piled Higher and Deeper refers to a fictional solution to the resulting housing crisis at Stanford University as "Hooverville" due to its proximity to Stanford's Hoover Tower. The 2005 version of King Kong, directed by Peter Jackson, depicts the Hooverville in New York's Central Park at the beginning of the film. The 2005 movie Cinderella Man also referenced the Central Park encampment. In the novel Bud, Not Buddy, set during the Great Depression, an early scene involves the police dismantling a Hooverville. Bud calls it "Hooperville". In Nelson Algren's A Walk on the Wild Side, the main character Dove Linkhorn is described as descending from "Forest solitaries spare and swart, left landless as ever in sandland and Hooverville now the time of the forests have passed." In John Steinbeck's famous novel The Grapes of Wrath, the Joad family briefly settles into a Hooverville in California. In Harry Turtledove's "Timeline-191" series of books, the equivalent of Hoovervilles in the United States and Confederate States are called Blackfordburghs and Mitcheltowns, respectively, after fictional Presidents Hosea Blackford of the US and Burton Mitchel of the CS. Hoovervilles are part of James Lincoln Collier's 2000 novel The Worst of Times: A Story of the Great Depression. The Talespin comic book The Long Flight Home portrays a Hooverville filled with anthropomorphic-animals. Kit Cloudkicker was also a resident of it before joining Don Karnage's air pirates. In Star Wars Rebels: Spark of Rebellion a Hooverville-like village known as "Tarkintown" (named after Grand Moff Tarkin) was shown on Lothal, filled with people who lost their land and farms to the Galactic Empire. ^ Kaltenborn, Hans (1956). It Seems Like, Yesterday. p. 88. ^ "Hoovervilles and Homelessness". washington.edu. ^ Mink, Gwendolyn; O'Connor, Alice (2004). Poverty in the United States: A – K. ABC-CLIO. p. 371. ISBN 9781576075975. ^ Carswell, Andrew T. (2012). "Hooverville". The Encyclopedia of Housing (Second ed.). SAGE. p. 302. ISBN 9781412989572. ^ McElvaine, Robert S. (2000). The Depression and New Deal: A History in Documents. New York: Oxford University Press. ^ Blum, John Morton (1993). The National Experience: A History of the United States Since 1865. p. 678. ^ Nathan, George Jean; Mencken, Henry Louis. The American Mercury vol. 34 (1935 ed.). ^ Danver, Steven L. (2010). Revolts, protests, riots, demonstrations, and rebellions in American History. p. 839. ISBN 1598842218. ^ Tugwell, Rexford G. (September 1972). "Roosevelt and the Bonus Marchers of 1932". Political Science Quarterly. 78 (3): 363–376. ^ Dickson, Paul; Allen, Thomas B. (February 2003). "Marching on History". Smithsonian Magazine. Retrieved April 12, 2018 – via smithsonianmag.com. ^ Gray, Christopher (29 August 1993). 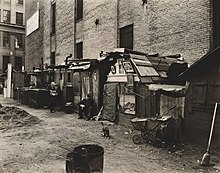 "Streetscapes: Central Park's 'Hooverville'; Life Along 'Depression Street'". The New York Times. ^ Vitello, Paul (4 April 2007). "Why Listen to the Substitute? At 81, He does Tell History Firsthand". The New York Times. ^ "Map of Hoovervilles". washington.edu. ^ "Hoovervilles in Seattle". Archives Document Library for Washington State History. Archived from the original on June 25, 2007. Retrieved April 12, 2018. ^ Towey, Martin G. (1980). "Hooverville: St. Louis Had the Largest". Gateway Heritage. 1 (2): 2–11. ^ Silver, Nathan (2000). Lost New York. p. 258. ISBN 0618054758. ^ Caldwell, Mark (2005). New York Night: The Mystique and Its History. p. 255. ISBN 0743274784. ^ "Hoovervilles and Homelessness". depts.washington.edu. Retrieved 2018-04-17. ^ Giovacchini, Saverio (2001). Hollywood modernism: film and politics in the age of the New Deal. p. 135. ISBN 1566398630. ^ Michener Smith, Cecil; Litton, Glenn (1981). Musical comedy in America. p. 314. ISBN 0878305645. ^ "Home Improvement". Stanfordalumni.org. Retrieved 2013-11-20. ^ "Housing – Hooverville". Phdcomics.com. Retrieved 2013-11-20. ^ Caldwell, Catherine (2002). Bud, Not Buddy: Study Guide and Student Workbook. p. 61. ISBN 1609336607. ^ Starr, Kevin (1997). Endangered Dreams: The Great Depression in California. p. 261. ISBN 0195118022. Hoovervilles and Homelessness from the Great Depression in Washington State Project, including photographs, paintings, maps, essays and first-hand accounts of life in Seattle's Hoovervilles. "Missouri Hooverville photographs". University of Missouri–St. Louis.